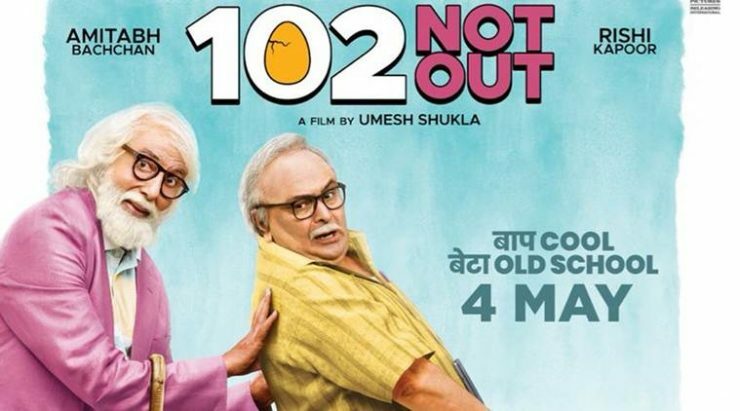 102 Not Out is a story of Dattatraya Vakharia (Amitabh Bachchan) who wants to live more 16 years to break the oldest living person alive. He wants to break the record of a Chinese man who has set this record. In order to win the record, people suggest Dattatraya to stay away from boring people like his 75 year old son Babulal Vakharia (Rishi Kapoor). Babulal is a disciplined and punctual son, basically belonging to old school. Datta decides to send Babulal to old age home. Babulal who cannot adjust anywhere asks for one more chance. Datta gives him a few challenges which he has to clear to stay in the house. Dhiru (Jimit Trivedi) is a helper at chemist and is a witness to the love-hate relationship of this father and son. Will Babulal agree to Datta’s conditions? They include writing a love letter to his dead wife, boycotting his USA based son. Amitabh Bachchan is perfect than a perfectionist, he is really enjoying his role in this movie. He is humorous as well as jovial. He has mastered Gujrati accent and has delivered an effortless and brilliant performance once again. He is blessed to get such roles at this time in his career. Rishi Kapoor, who has done such roles in his earlier movies proves that he can do serious roles too. Such actors can never get old. He makes everyone laugh as well as cry. Jimi Trivedi, who is making a comeback with this movie has a lot of talent in him. He should get more better offers. A beautiful movie, noteworthy screenplay and a good script – makes the film more pleasant to watch. Songs are placed well and go well with the background. ‘Bachche Ki Jaan’ and Kulfi go well with the sitation and highlight the light moments of the film. Perfect family entertainer – A must watch movie. Amitabh Bachchan and Rishi Kapoor will become more loving after watching this movie. Excellent Review, will surely watch this movie.